These paint mixing cups are semitransparent and strategically labeled with liters, ounces, pints, and ratios to allow for precise measurements when mixing paint. They are made of solvent-resistant plastic and are safe to use with all paints, pastes, and adhesives. Three paint mixing cup sizes for professionals and creating do-it-yourself masterpieces. Plastic paint containers can be ordered with or without storage lid. Quick shipping from Virginia. 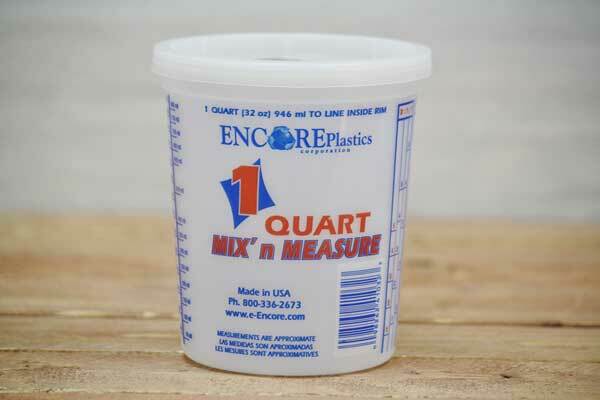 The 16 ounce cup features just milliliter and ounce liquid measures. Made in the USA. We also offer small paper paint mixing containers.